I got Naked with a bunch of other people last night. 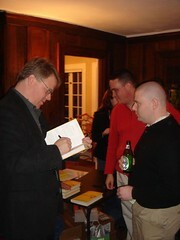 That is to say I went to Naked Conversations' first book launch party, by Microsoft's Robert Scoble and Shel Israel. In attendance was a venerable who's who of Seattle area bloggers and geeks: Chris Pirillo (he's got a video on last night), Mitch Ratcliffe, Gretchen and Josh Ledgard, Jack William Bell, Anita Rowland, Duncan Mackenzie, Betsy Aoki, Brian Jones, Todd Bishop, Buzz Bruggeman, Kintan Brahmbhatt, Dean Hachamovitch, John Musser, Jeff Sandquist and Brady Forrest. There were plenty of others there too that I either didn't meet nor know. 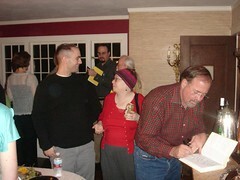 The party took place at the home of John and Alison Dillow (near to Bill Gates'). Amazing house. Lots of good food and drink (the pate was particularly good. I asked the chef about it, but she told me she'd have to kill me if she gave me the recipe). I took a bunch of pics and also picked up a second copy of the book. A second copy because my first (pre-ordered last year on Amazon) is not scheduled to arrive until the 27th of Jan, and I can't wait that long to get my hands on it. So I'll have two copies. One thought I had: take a pic of Robert and Israel naked in the jacuzzi together and run a caption competition on my blog. The prize would be a signed copy of the book...I suggested the idea to Shel, but he politely declined. Understandably. It occurred to me that the launch party's guest profile (the first party of a few to come I understand) was quite different to what it might have looked like a few ago - there were plenty of bloggers there - not associated with traditional media. I suspect most of the bloggers there last night will be tapping out their posts over the next few days and help generate some buzz about the book. In fact, they already have. Self-referential I know, but that's one of the points the book has to make. My wife, who also came to the party and is not a blogger today, was intrigued by what blogs could do for business...she asked me after the party whether I thought she should start blogging to help generate some business for her company (plug: it's called Unwind, a corporate stress management solutions - or in blogger-speak: Chair massage at the workplace). My response? 'Read the book', I said. Thank to Robert for the invite, really enjoyed it. The book will do great. I didn’t manage the same catalog of bloggers you did Alex for which I hope to be forgiven. Your wife is lovely and it was fun to see her again. Does Unwind come to home offices? 🙂 If so, sign us up!